Blktec is a new company that quietly debuted at Taipei show earlier this year with a couple of wheels, but Eurobike saw the entire line roll out. The highlight is definitely the R3 bar and stem combo shown above. 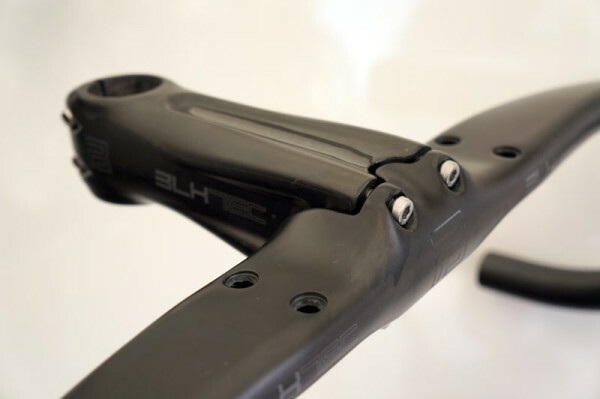 Using a unique two-piece construction that bolts the handlebar directly to the stem, it forgoes the front clamp altogether but still allows 6º of adjustment by simply loosening or tightening the top or bottom bolts. It, along with the other bars and stems, features clever internal cable, with some feeding everything through the stem to shield it from sight and wind. Simply loosen top bolts and tighten bottom ones to rotate the bars down, and vice versa. Construction is full carbon monocoque. All cables and wires run inside the bar to gain a small aero advantage on the R3. Holes for mounting their under-or-over aero bar extensions are standard. It’s available in 40/42/44 cm widths (center to center). They didn’t have the production weights available, but word is some major brands were coming to by to check it out (it’s patent pending).